ProtoCOL 3 is the next generation instrument for colony counting, zone measurements (inhibition and antibiotic susceptibility testing (AST), membranes, Petri-film and a range of other applications including: spiral plates, OPKA (opsonophagocytic killing assay), SBA (serum bactericidal assay), Multi-sector, Multi-well, SRD (single radial immunodiffusion) and Ames. The new design now enables plates of up to 150mm diameter to be automatically read at the press of a button. Designed for use across a wide range of applications, ProtoCOL 3 will count colonies as small as 43 microns (0.043mm) or measure zones accurately to 0.1mm. ProtoCOL 3 has a unique LED lighting system configured for exceptional illumination of all sample types. High definition, colour images taken with a 1.4 mega pixel scientific grade CCD camera ensure that even the smallest colony can be seen and counted, while zone measurements are fast, accurate and reproducible. ProtoCOL 3 is available with a mounted touch screen processor which enables ease of control while the easy-to-use software produces highly accurate results. Alternatively, the ProtoCOL 3 can now be used with a new or existing stand-alone desktop or laptop computer via USB connection – no additional PCI cards are required. The new ProtoCOL 3 comes inclusive with both colony counting and zone measuring ability. To extend its range of applications, inexpensive additional modules can be added to the software for Spiral, OPKA, SBA, Multi-sector, Multi-well, SRD and Ames. Results can be automatically transferred to Excel or a LIMS system. The system can also be used with 1D and 2D barcodes. All data generated is GLP/GMP compliant with a full audit trail and can be used to produce professional reports. Each system comes complete with 2 validation plates. ProtoCOL 3 is typically used when large numbers of plates need to be counted or measured rapidly and accurately. 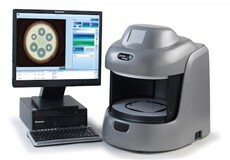 The ProtoCOL 3 is therefore perfect for high throughput applications. All counting and measuring functions are automatic with results instantly sent to the internal reporting system. The unique LED lighting in the system gives full colour images. The colour classification feature of the ProtoCOL 3 software allows for an infinite range of colour options on the same plate. A choice of sample holders is included for both light and dark backgrounds, depending on sample type. The system can be configured for a wide range of plate types. These include pour plates, spiral plates, multi-well, SBA, OPKA, Ames, inhibition zones, AST and SRD. Plates up to 150mm can be used on the standard unit, while an optional external scanning device can be added should larger plates need to be processed. One of the major benefits of an automated system is that reports can be generated within the device. ProtoCOL 3 will produce reports that can easily be exported to Excel at the touch of a button. All the data generated has a full audit trail. All report generation is traceable and has an audit ‘lock’. Data is CFR compliant and the system can be connected to a LIMS if required. ProtoCOL 3 uses a highly sensitive CCD camera with a high resolution. Colonies as small as 43 microns (0.043mm) can be easily counted and zones can be accurately measured to 0.1mm. There are no threads in Synbiosis ProtoCOL 3 Reviews at this time.